Thinking of today’s and past Christmas Eves, I decided on making another tradition. Making breakfast for my little two-year-old grandy-girl and her mommy (my daughter) and her daddy. What brought that on was hearing Little Sweet saying she wanted waffles. “You want waffles?” I asked, wondering if I was hearing her correctly. 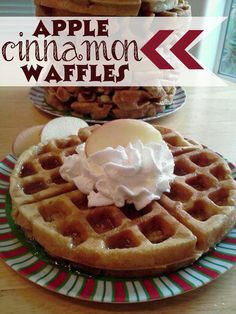 I had seen a yummy-licious-looking apple-cinnamon waffle (photo above) on Pinterest. Sounded like a good idea for a new Christmas Eve breakfast. Curious about what made Little Sweet ask for waffles, I asked my son-in-law if he had been making waffles. Yes, he said he had. He is a good cook and makes the best waffles. Christmas Eve morning arrived, Little Sweet awoke, her daddy was playing a game, and her mommy was playing another game. It looked like a good time for me to visit the kitchen and start our apple-cinnamon waffles. Choosing pork sausage patties and cheddar cheese omelets as side dishes, this Christmas Eve waffle breakfast was made complete. Another possible tradition for future Christmas Eves. Christmas Eve food traditions change as the family grows and each one has a different favorite comfort food. I’d say my favorite foods for this holiday are anything breakfast – and chocolate meringue pie. Since I had it already at the big family party held annually on my mother’s side of the family, I’ll pass for today. I even ate the piece of chocolate pie first, before the main meal. There are good reasons for that decision. One, I was helping Little Sweet eat. It was easier to eat a piece of pie than a whole plate full of food while trying to maneuver her on my lap. Two, I didn’t want to miss out. The chocolate meringue pie would surely disappear if I didn’t grab a piece quickly. Of course, I could have saved the piece of pie and eaten it after the main course. That would have taken away all the fun, though. It was Christmastime. Time to be a kid again – like eating your dessert first. Cinnamon Apple Waffles sound delicious. I’m off to pinterest to find that recipe. I’m glad you liked the Cinnamon Apple Waffles!